The Butte County Career Technical Education Center is combating the skilled worker shortage by launching trade skills training in a series of short-term programs. 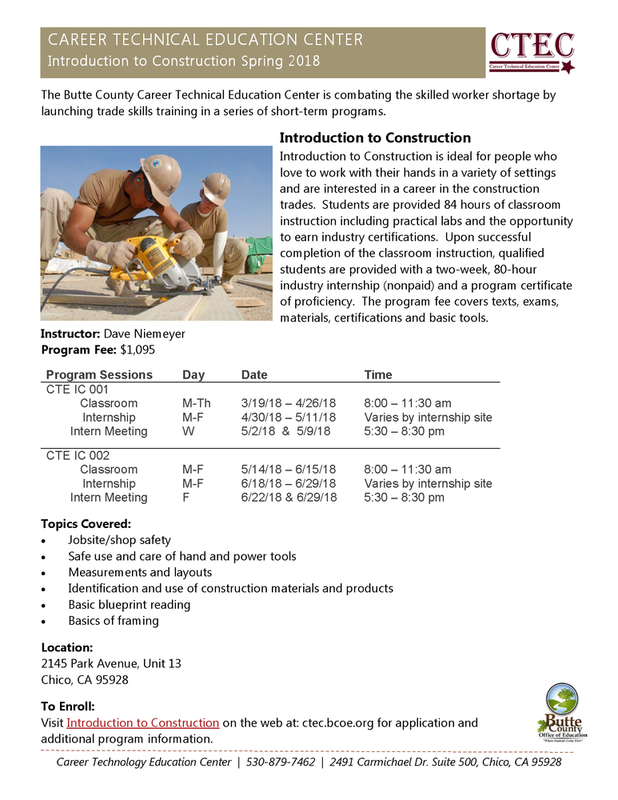 Introduction to Construction is ideal for people who love to work with their hands in a variety of settings and are interested in a career in the construction trades. Students are provided 84 hours of classroom instruction including practical labs and the opportunity to earn industry certifications. Upon successful completion of the classroom instruction, qualified students are provided with a two-week, 80-hour industry internship (non-paid) and a program certificate of proficiency. The program fee covers texts, exams, materials, certifications and basic tools.